VapeOnly vPipe 3 Mod is a spare part of vPipe 3 kit. Made from high-end rosewood with delicate craft, this mod perfectly combines traditional pipe functions with new revolutions. Its LED light indicator blinks from up to down when using. Powered by a single 18350 cell, the mod will supports a long vaping and bring you top level vaping experience. VapeOnly vPipe 3 Mod is a spare part of vPipe 3 kit. Made from high-end rosewood with delicate craft, this e-cig pipe device feels comfortable when in hands. 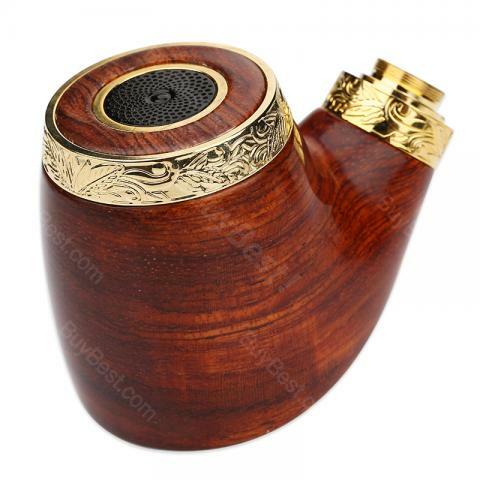 Besides, this mod perfectly combines traditional pipe functions with new revolutions. The VapeOnly vPipe 3 Mod has a LED light indicator which will blink from up to down when using. Powered by a single 18350 cell (not included), the mod will supports a long vaping and bring you top level vaping experience. Get it as a spare part for your vPipe 3 kit. • You can buy vPipe 3 Kit/vPipe 3 tank/vPipe 3 coil. • No 18350 cell included. My cousin uses vapeonly and I ordered this beam mod for him. He says it's nice and quality is excellent. VapeOnly vPipe ist ein super Produkt! Lieferung ging recht schnell, Optisch ist diese E- Zigarette ein Hingucker.